Back in the days, with Windows Vista, you would get one disk that would install all four versions of Vista such as Home Edition, Business Edition, Etc. 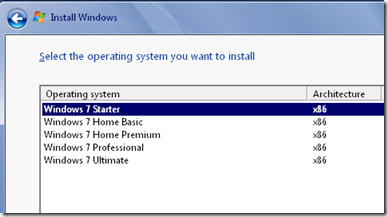 With Windows 7, you now need to carry 9 different DVD’s as there are five 32 bit editions and four 64 bit editions as well. Now with a special utility that removes one file from the disk image you can hark back to the days when you could install any version of Windows from one 32-bit and one 64-bit disk so you only need to carry two disks instead of 10. The utility that removes the ei.cfg file, the single file on the disk that needs to be removed to unlock its potential, can be found here. Note that you have to have a .ISO file image of the disk and can not edit on the disk directly. To create a .ISO file from your existing disk I recommend Magic ISO Maker. But why carry around disks anymore at all? The Microsoft store has released a Windows 7 USB tool which allows you to create a bootable USB thumb drive to install Windows 7 from. You will simply need a 4GB or larger blank USB thumb drive, which you can find on NewEgg.com starting at around $10.